Emelia Forsyth rides Henton Faberge in the Horse 1.40m, Land Rover Horse of the Year 2019, HB A&P Showgrounds, Hastings, Hawke’s Bay, Tuesday, March 12, 2019. 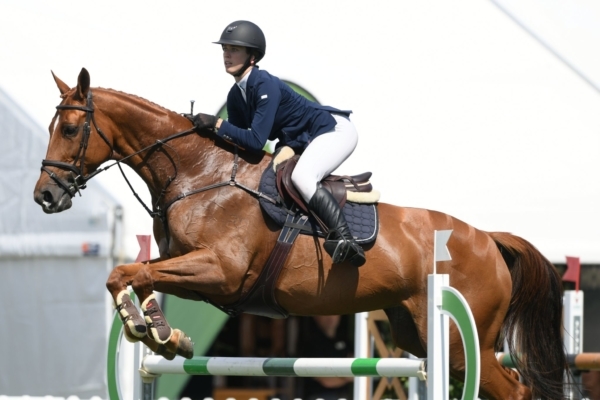 Emelia Forsyth has finished her season on a high with wins in both the Equissage Horse Grand Prix and FMG Young Rider at Showjumping Waitemata’s Grand Prix Jumping Show at the weekend. Aboard her feisty chestnut mare Henton Faberge, Emelia made it three wins from three starts after her victory in the 1.35m championship at the recent Land Rover Horse of the Year Show. Emelia and Henton Faberge picked up four faults mid-course in the opening round of the Horse Grand Prix but it was still a winner. Teen Emma Watson (Morrinsville) and Letino took second place with Vicki Ridley (Karaka) aboard Mosaic II in third. In the Young Rider, Emelia and Henton Faberge, who is owned by the Sutton family, were the fastest of the four through to the jump-off. Ben Weir (Waitemata) and SF Gryphon were second with Emma Watson (Morrinsville) aboard Letino once again in the money with their third placing. Emelia puts much of their success down to her trainer Blyth Tait. “He has been great – he loves his hot chestnut mares and we haven’t tried to change anything about her. She’s quite unorthodox and a real character – every day is different – but we work with her on that,” says Emelia. It was super exciting times in the Country TV Pony Grand Prix class where Sophia Hall (Auckland) and her Australian import TCG Centadel headed home a heart-stopping jump-off to take the honours – their first as a combination. Just two came through to the jump-off where the vastly-experienced Emma Watson (Morrinsville) and her former Pony of the Year winner Maddox Fun House took a rail to stop the clock at 46.92. Sophia knew she needed to go for the steady clear, and came home leaving everything up in 60.42 seconds. The combination have placed in 10 of their 11 starts this season. The soon-to-be 15-year-old has only had the pony five months and have gelled quickly. They are trained by Duncan Mcfarlane and Jacque McKinley but at the weekend it was Amelia Clark who walked the course with her and helped out at the show – their last of the season. The show attracted around 300 combinations, introducing top score classes over the usual two phases which proved very popular with both riders and judges who all enjoyed something a little different. Another exciting new addition were the rookie rider and pony mini prix classes which were both run in the main arena and offered prizes comprising two lessons, each donated by top trainers, for the first 10 place getters. Philippa Howells designed the courses for ring one with Wayne Bragg in ring two and Gina Moss in ring three. Country TV Pony Grand Prix: Sophia Hall (Auckland) TCG Centadel 1, Emma Watson (Morrinsville) Maddox Fun House 2, Georgia Bouzaid (Cambridge) Redcliffs Bill 3, Crystal Hackett (Auckland) The Dreamer 4, Summer Denize (Kerikeri) Bella Vinci Duet 5, Shanae Savannah (Silverdale) Tiger Tale LS 6. Dunstan Horsefeeds and Equifibre Pro-Amateur Rider Series (sponsored by Auckland Insulation): Christine Cornege (Cambridge) Varekai SL 1, Tim Featherstone (Kerikeri) Kiwi Supakee 2, Sandra Stanford-Soons (Waitemata) El Vira 3, Kady Prujean (Hawke’s Bay) VPS Call Me Cash 4. Hinterland Amateur Rider Series (sponsored by Auckland Insulation): Paxton Conder (Auckland) La Fonteyn 1, Amy Schischka (Waiwera) Rock It 2, Shelley Ross (Auckland) Elvis II 3, Shelley Bridgeman (Auckland) Oaks Vendetta 4, Susan Le Mesurier (Auckland) Sparky Malarkey 5, Louise van der Sande (Cambridge) Aratoro Melodia 6. Dunstan Horsefeeds and Equifibre Junior Rider Series: Keeva McCambridge (Cambridge) Hey There Delilah 1, Olivia Dalton (Karaka) Appleton 2, Nicole Lelean (Kumeu) Valetto 3, Emma Watson (Morrinsville) All About Fun 4, Hayden Pringle (Northland) ME Diamond 5. FMG Young Rider Series: Emelia Forsyth (Clevedon) Henton Faberge 1, Ben Weir (Waitemata) SF Gryphon 2, Emma Watson (Morrinsville) Letino 3, Elmo Jackson (Auckland) Fairview Animation 4, Colleen Crous (Auckland) Orames Girl VDL 5, Patrick Deane (Cambridge) Airborne 6. Pony Mini Prix 1.05m: Nicole Weatherley (Morrinsville) Jambalaya 1, Emma Watson (Morrinsville) Taylor Made Gift 2, Stratton Craig (Northland ) Redcliffs Ted 3, Sarah Fisher (Waiuku) Summer Eclipse 4, Shay Bond (Northland) Redcliffs Sheeza Cutie 5, Samantha-Lee Wakeling (Waitemata) BMW Renegade 6, Ella de Leeuw (Cambridge) Just Nuts 7, Laura Bolton (Waitemata) Pioneer High Jinx 8. Rookie Rider Championship 1.1m: Beth Clothier (Waitemata) De La Mexican 1, Nicole Lelean (Kumeu) Valetto 2, Isabelle Jameson (Northland) Pacific Ambition 3, Lucas Bremner (Northland) Triple Star Destiny’s Accolade 4, Charlotte Kedzlie (Auckland) Primadonna Boy 5, Dana Hawkins (Northland) Bold Trader 6, Senga Hickson (Cambridge) Pickpocket 7, Rosa Katavich (Waitemata) The Coalman’s Daughter 8, Keeva McCambridge (Cambridge) Hey There Delilah 9, Chloe Browne (Ohaupo) Lucca 10. Pryde’s Easi Feed Young Horse Championship: Isabelle Jameson (Northland) Pacific Ambition 1, Paula Mussen (Pukekohe) Déjà vu NZPH 2, Vicki Prendergast (Matamata) Stella 3, Savanna Stirling (Auckland) Koromiko 4, Olivia Prendergast (Matamata) Souther Field 5, Georgia Lawrie (Waitemata) Cartello GNZ 6. Style Prizes, Four-Year-Old: Georgia Lawrie (Waitemata) Cartello GNZ. Five-Year-Old Olivia Prendergast (Matamata) Souther Field. Six-Year-Old: Paula Mussen (Pukekohe) Déjà vu NZPH.